Although history adventuring in my imagination is wonderful, because I can travel to anytime, be anyone, and go anywhere, every once in a while I'm privileged to accompany one of my PhDs (Phoenix History Detectives) to go history adventuring IRL - which is an internet abbreviation for "In Real Life". But the real world has limitations for me that I try not to worry too much about, and although it's not a secret, I do try to keep my limitations "behind the scenes". I wobble. 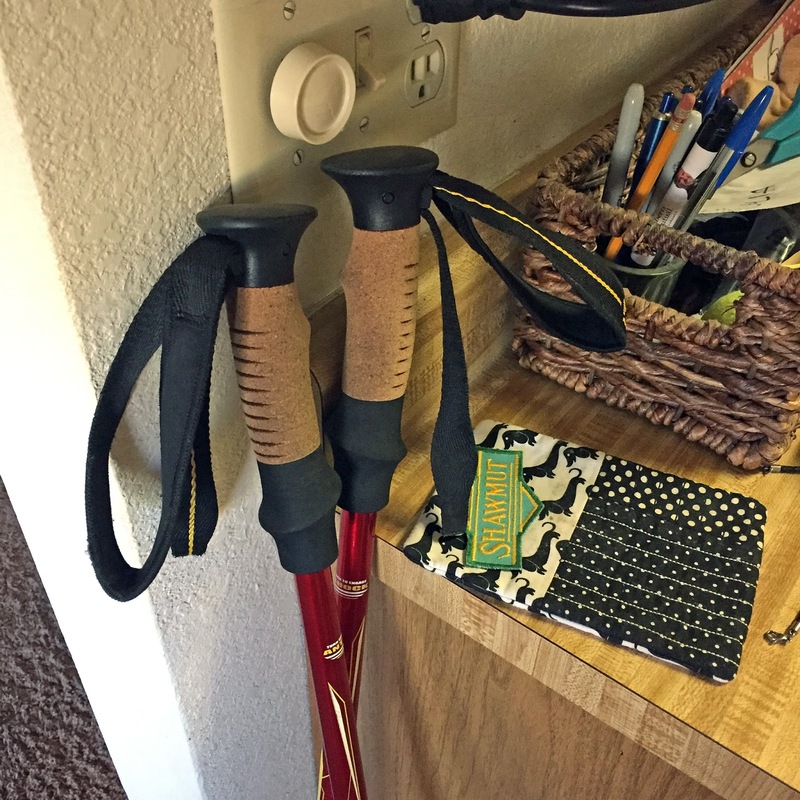 I bought these nice walking poles a couple of years ago while I was out history adventuring in Prescott. As someone with a vestibular disability (I wobble) just the small undulations of the sidewalks there can be difficult for me, but these are the places that I love to go. I got these, and practiced with them, and although they're intended for "power hiking", they help me to just mosey along, which is what I really love to do. I dislike carrying a cane, and a cane really doesn't work for me, as I would need to switch it back and forth from one side to the other. When I first tried the walking poles, they worked for me. If you haven't used them, you might be surprised at how much weight is held by the straps. That is, you don't need to hold on tightly to the handles, you just lean into the straps, that have to be adjusted just for you. It's surprisingly comfortable, and sturdy. I have good upper-body strength, and this takes a lot of strain away from my weak ankles. OK, I don't want this to sound like an infomercial here! Let's see, in the photo you can see the pad where I leave my cell phone, with a wiener dog pattern, made by a good friend, and a patch that another friend gave me after I visited Shawmut, Arizona. And I always find little things to remind me of my trips, I'm a little kid that way. Sometimes it's just a rock that I put in the garden, and each time I look at that rock it reminds me of an adventure. They're small rocks, but they mean everything to me. I won't be packing a lunch for tomorrow, so part of the adventure will be finding food and water out there somewhere in Arizona. My co-adventurer knows that I will need to get food and water during the day, so I'm not worried. I've been with people who won't stop, and I just won't adventure with them. Adventurers stop, look, and listen!